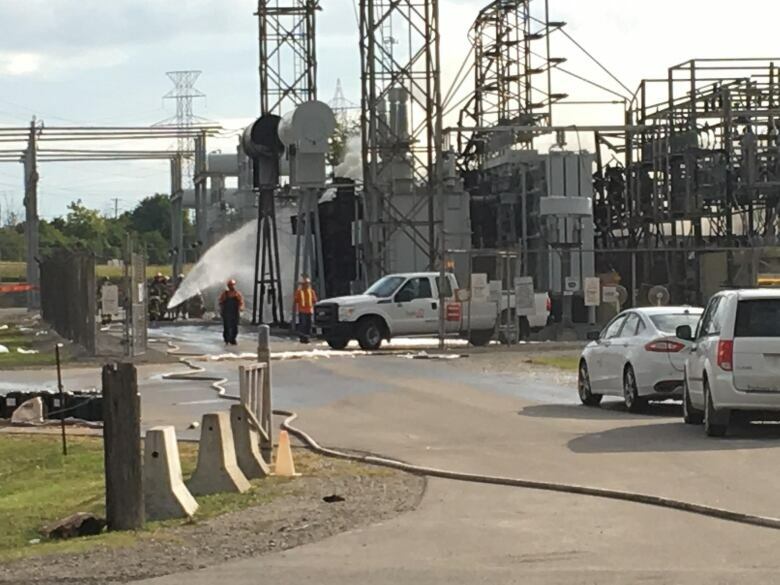 Power has been fully restored to thousands of Toronto Hydro customers in North York after it was knocked out by an explosion and subsequent fire at a hydro station overnight Saturday. The explosion struck the station, which is operated by Hydro One, shortly after midnight. The building at Finch Avenue W. and Signet Drive was completely engulfed in flames when fire crews arrived at the scene, said Capt. David Eckerman, adding that eight trucks were needed to fight the blaze. "Due to the extremely high voltage in the area, we were advised by Hydro One not to apply water before they could shut off power," he said, noting it took an hour for the utility provider to cut off the supply. Hydro One spokesperson Tiziana Baccega said the station had to be de-energized to ensure it was safe for emergency responders to do their work. This was done remotely from a facility in Barrie, she explained. Firefighters began battling the blaze shortly after 1 a.m. It took approximately three hours to "predominately" knock down the fire, said Eckerman. He added that no one was injured in the fire and no evacuation order was issued for nearby apartment buildings despite plumes of smoke that closed a section of Highway 400 overnight and was bypassed by planes at Pearson International Airport. 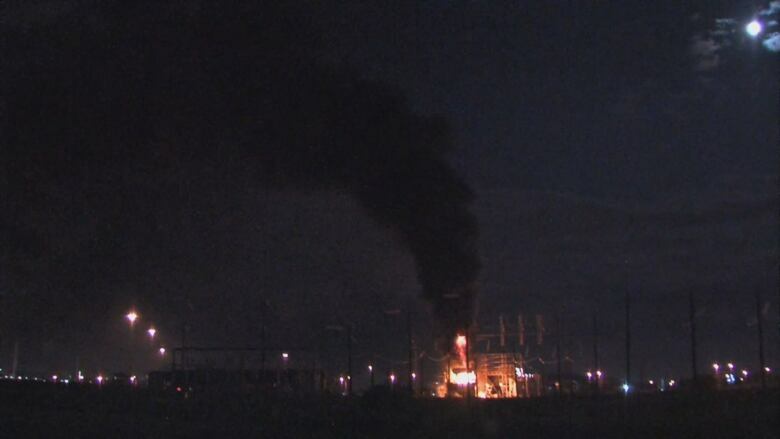 The fire, however, ruptured transformers that leaked oil, Eckerman said. Hydro One explained that non-toxic mineral oil is housed in transformers. Baccega added there is no risk to public safety or environmental impact from the leaks. Fire crews remained at the scene early Saturday to extinguish hot spots and poles that continued to flare. Eckerman predicted it could take firefighters up to one day to fully cool the transformer. About 35,000 customers were in the dark at the peak of the outage, around 1 a.m., in an area bordered by Steeles Avenue W., Keele Street, Highway 401 and Kipling Avenue. Initially, Hydro One crews were granted limited access to the station, which impacted their ability to swiftly restore power, said Baccega. It wasn't until firefighters cooled the oil in the transformers that Hydro One crews progressed in fixing the outage by the late afternoon. Based on the utility's assessment, Baccega told CBC Toronto, two out of four transformers at the station were not affected. A thousand people remained in the dark overnight Sunday while crews continued to work on fixing the equipment. Power was fully restored as of 9:30 a.m. The situation changed again by late morning. As residents used more electricity in the area, spokesperson Tori Gass said, Toronto Hydro initiated a "proactive" power outage to prevent further damage to the remaining transformers at the site. The Ministry of Environment was called hours after the fire erupted to assist in a "containment capacity," said Eckerman, and public works crews also used a vacuum truck to clean up excess water. But an unconfirmed amount of the transformer's mineral oil leaked into the Humber River, said spokesperson Gary Wheeler. He added the substance was tested and found it doesn't contain harmful contaminants. Absorbent booms were placed in the water to prevent the spill from spreading, Wheeler said.